I wasn't sure what I was going to do for this sketch challenge. I had stamped some images to try the no line copic coloring, in between rounds drag racing, when it came to me. I decided the kittens from MFT's I Knead You set would be perfect. I chose a scalloped rectangle from MFT Blueprint 20 and cut my background paper. The three stitched circles were cut out of Stampin' up Tangerine Tango using Blueprints 18 and mounted on fun foam. 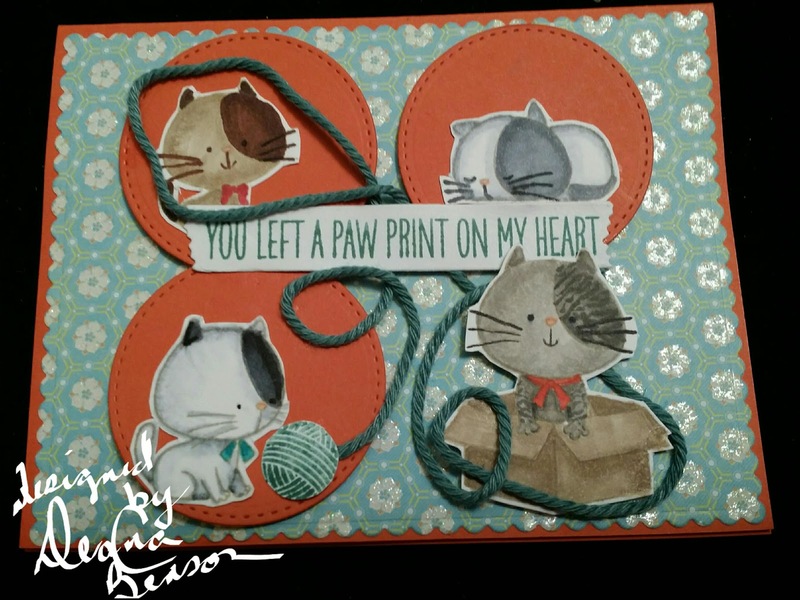 I thought It would be cute to have real yarn run all over the card so I stamped the ball of yarn in Stampin' up Lost Lagoon and used a piece of yarn in the same color. My sentiment is stamped in Stampin' up Lost Lagoon on a piece of Neenah Solar white which was die cut using Blueprints 13. Thanks for stopping by come back soon.